The Mercedes-Benz SL fourth generation R 129 (1989-2001). Bruno Sacco, one of Daimler&apos;s most influential post-war designers, was responsible for the transition from the 18 year old R 107 model to the R 129. 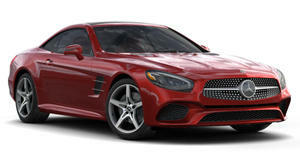 From the front the change is clear: no more three-pointed star with two metal stripes stretching out from both sides. Instead, the star is surrounded by seven stripes. To complete the front-end&apos;s revival, two new almost square headlamps were adopted. However, they weren&apos;t relatively big and dominant as were the headlamps from previous models. Sacco gave the R 129 a modern and dynamic look with a windscreen slanted sharply backwards, and the front grille is also tilted backwards. The stance is more aggressive, but the overall visual impression is of a more rounded car with less sportive ambitions. The hood is sleek without any bulges. The antiquated interior design, with the large round gauges from the &apos;50s and old materials from the &apos;60s was replaced with one unit of three smaller gauges with modern fonts. The round air vents gave way to almost invisible rectangular units, and the center console became a command center for various ancillaries that were popular at the time. The car remained a two-seater though two small rear seats, suiting for babies, were installed. As far as engines were concerned, the R 129 had quite a few inline-sixes, V8s, and even the first V12 engine in an SL. Another first for the series was the automatic roll-over bar which was used for the first time in a road car. So as not to impair open-top driving pleasure with a permanently installed, rigid roll bar, a flexible solution was realized which activates the roll-over protection only if needed. When not in use the safety bar is deposited in front of the soft-top compartment. When a roll-over threatens, the sensor-controlled roll-over bar is electromagnetically triggered, raised into position by the force of pre-compressed springs within 0.3 seconds and secured by pawls. The high-strength center pillars, connected over a large area with the rear longitudinal members, serve as a basis for mounting and as support. In addition to automatic triggering in an emergency, by means of a switch the driver can choose to raise and lower the bar slowly, with a hydraulic element carrying out the action. An ABS system was also a new innovative concept that later became a common feature in almost every car.